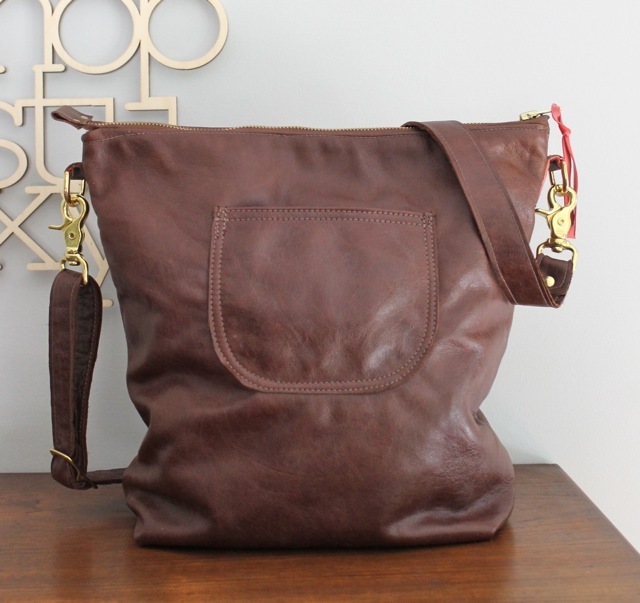 Made from the same great mocha leather, this bag is a ittle bigger than yesterday’s– 14.5″ wide, 13.5 tall and 5″ deep–so it is ready for all your gear. 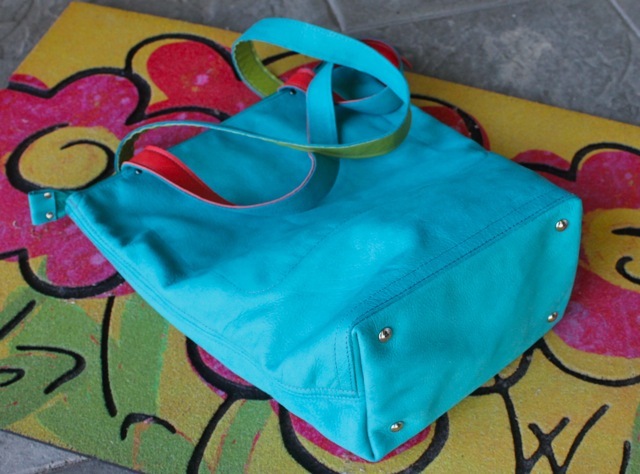 It has all the features of a Luna bag including an extra leather piece riveted in the bottom for strength. 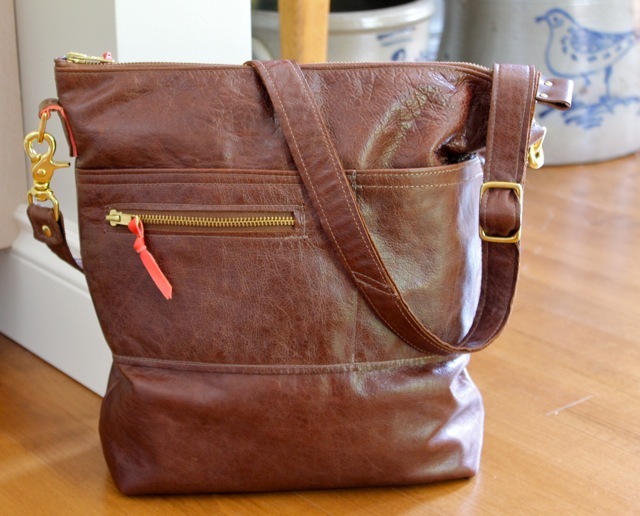 It has two large pockets on the front, two leather pockets inside, an adjustable strap and is lined with a great wax print which I bought in a market in Kenya. 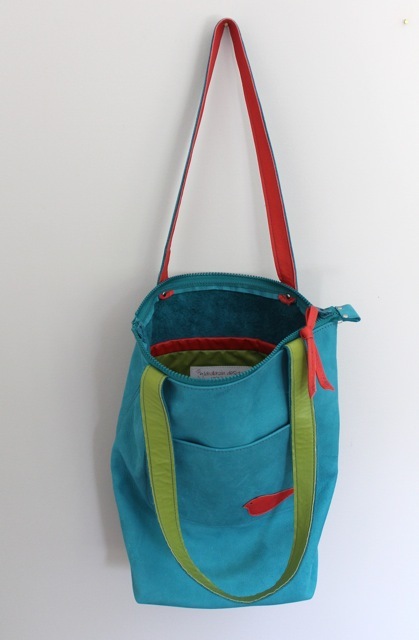 This bag will be in the on-line shop by tomorrow. 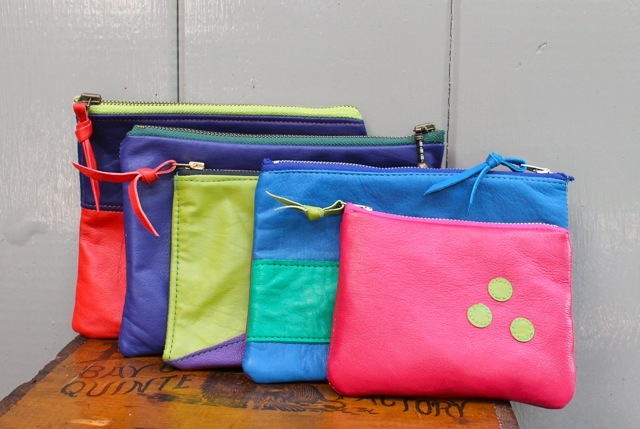 There are three colour therapy pouches left in the shop. Also some new triads coming later this week. 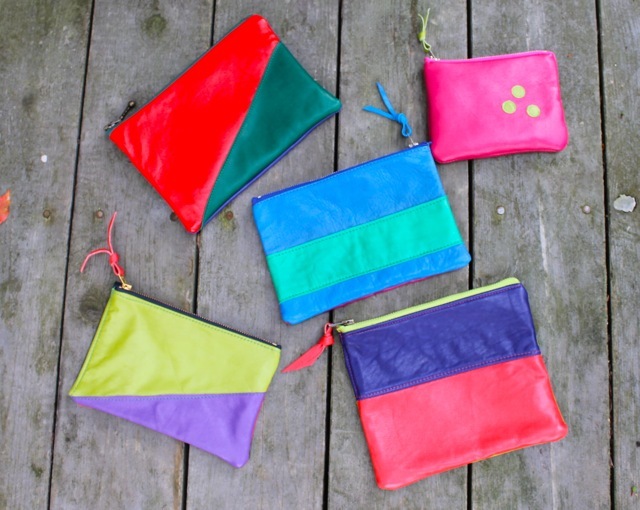 Here are some new Colour Therapy pouches made out of my scraps of recycled leather. 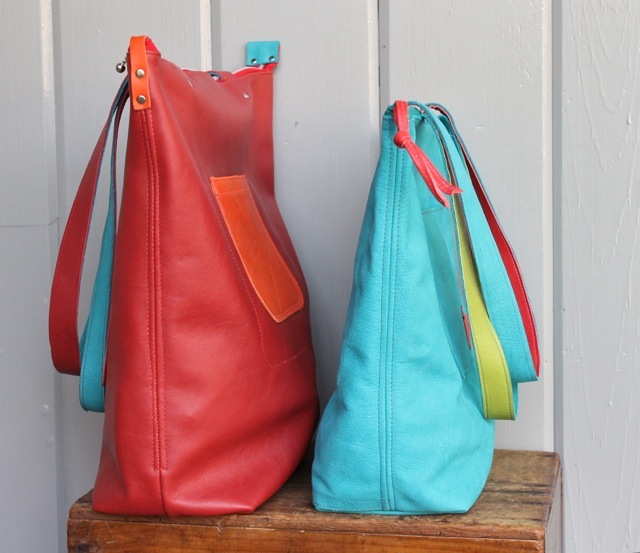 I love combining the various pieces of skirts and jackets and coloured zippers to make a statement. 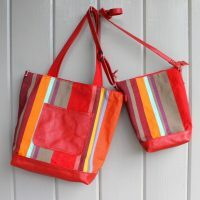 Some of these are lined with fine black cotton and some with cotton batik. 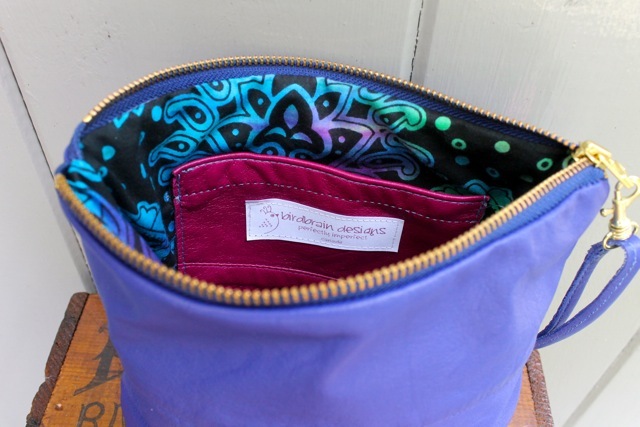 Each pouch will be listed separately in the on-line store, I hope by tomorrow. 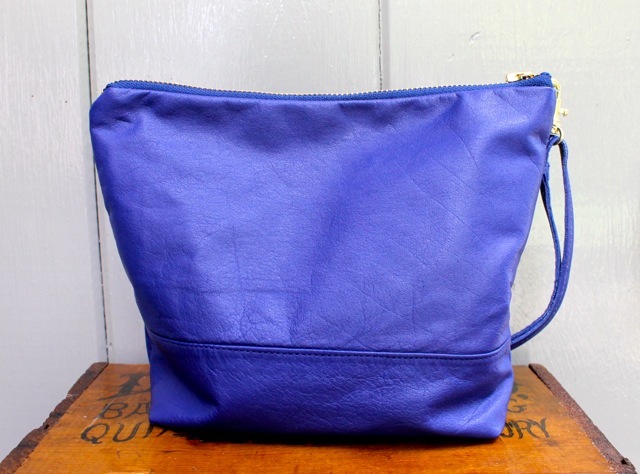 I’ve also made another cobalt clutch with detachable wrist strap, great batik lining and a magenta leather interior pocket. 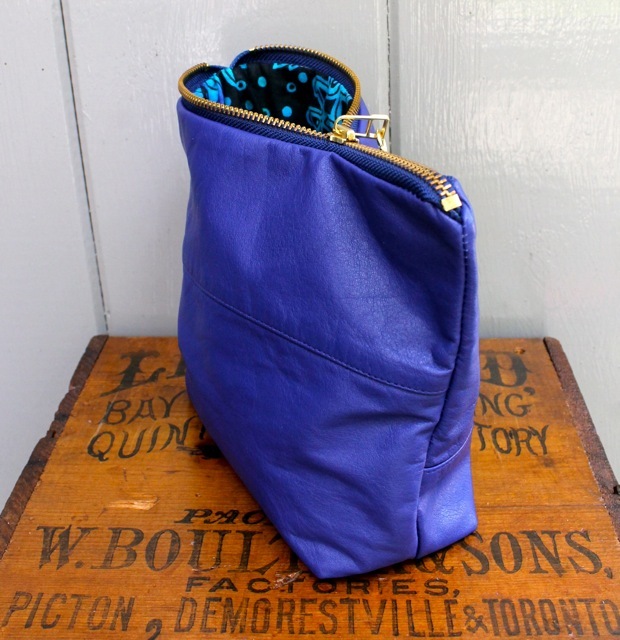 This is a rich colour and super leather–you may remember my finding not one, but two cobalt leather skirts. So I should be able to make a couple more of these. 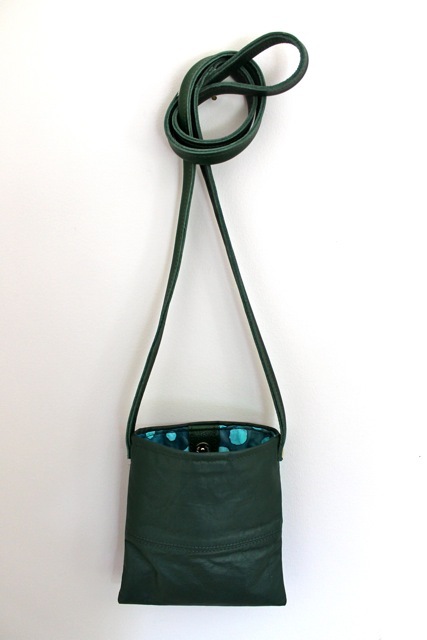 This one is a great size–9.5″ wide, 7.5″ tall and 3″ deep–will carry all your essentials. 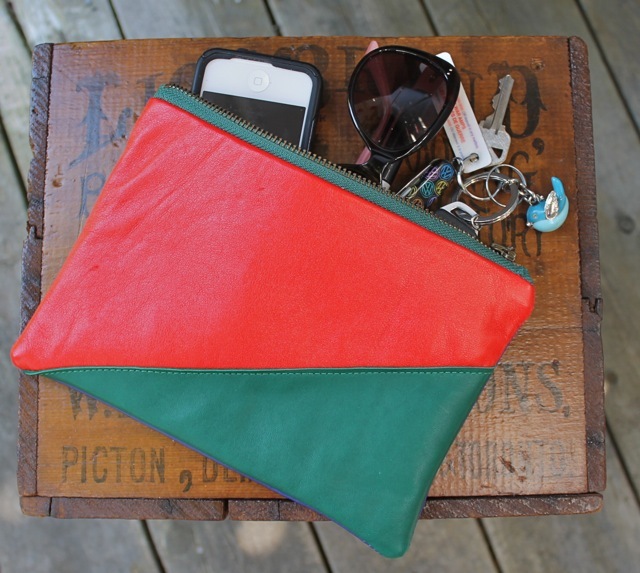 The interior slip pocket is great for subway tokens, credit cards or theatre tickets. 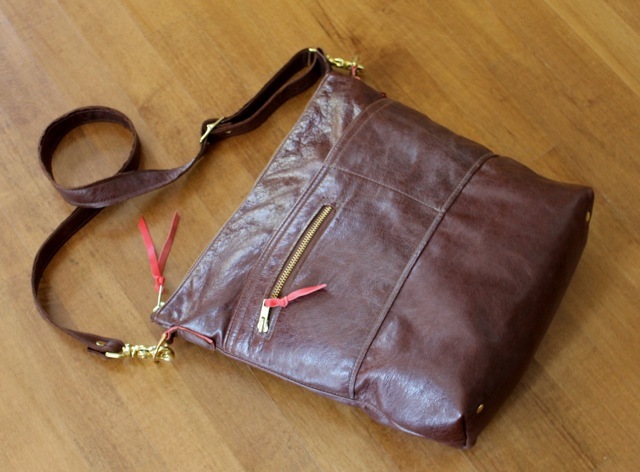 And the clip-on wrist strap is for easy carrying — or attaching inside your tote or travel bag. 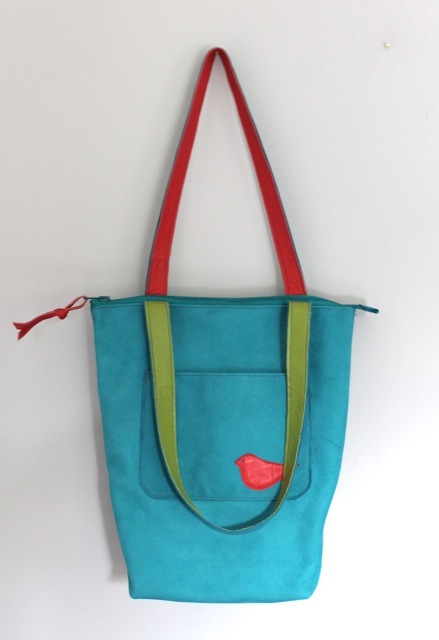 Check the shop tomorrow morning for this too. 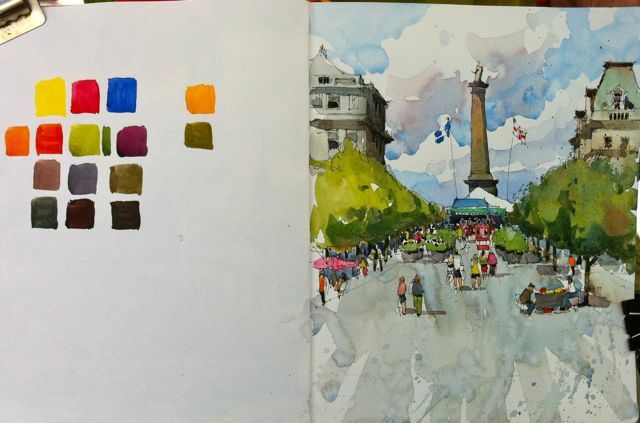 I spent day two of the USK Montreal learning from Shari Blaukopf, beginning at the bottom of Place Jacques Cartier looking toward Nelson’s column. 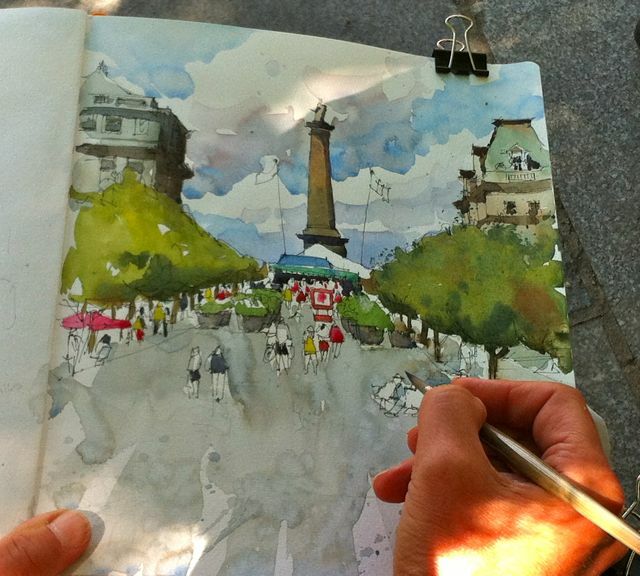 Below are the stages of Shari’s excellent demo from value sketch to the final product. 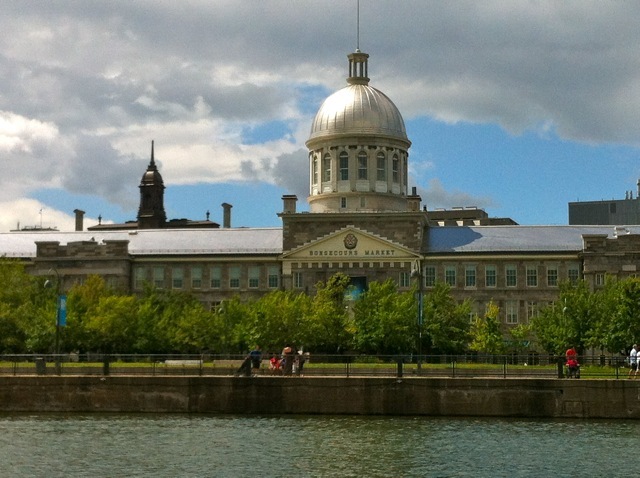 In the afternoon we went to a quiet spot with a great view of the 1847 Marché Bonsecours. The skies were changing swiftly, there was lots of wind and a little rain. So much wind, in fact, that my hat blew away. But as I said, this workshop has it ALL. 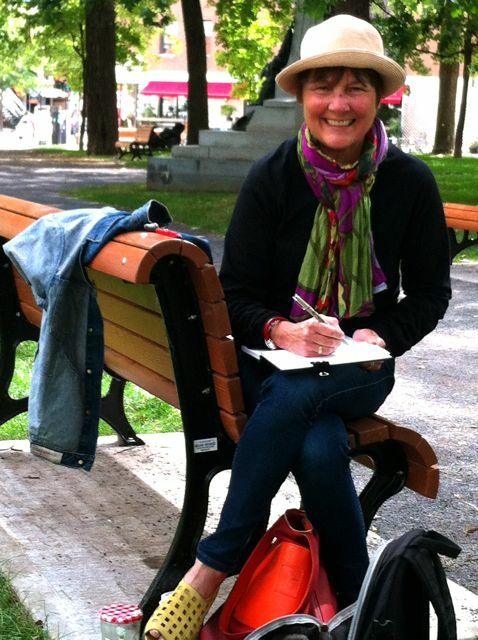 On Sunday Shari arrived with a hat for me! 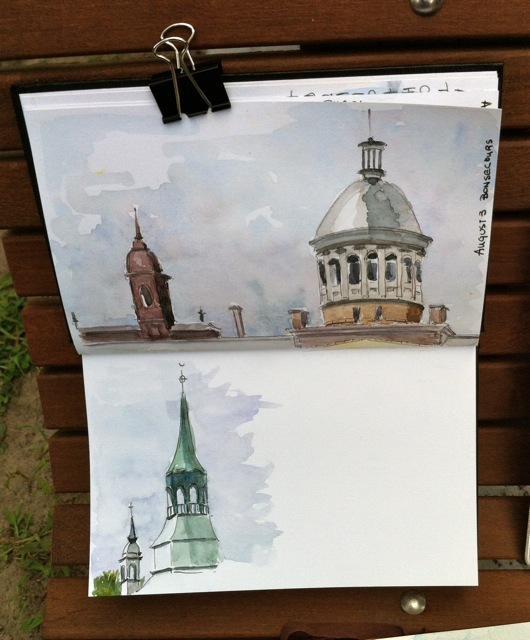 Below is my sketch and two others I managed to photograph before the rain drops. 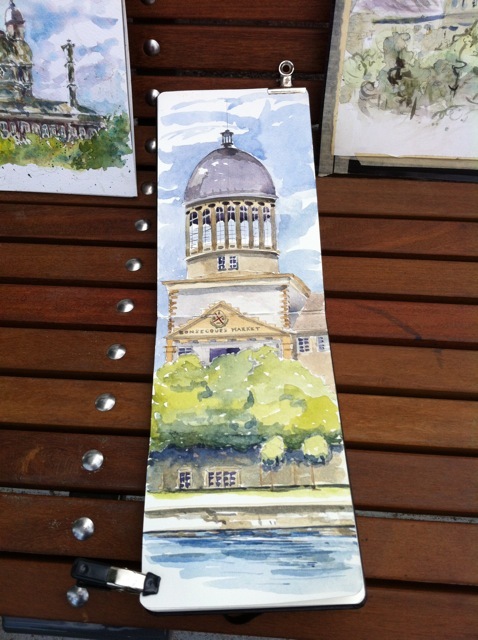 The final picture is from Sunday in Carré St. Louis with me sporting my new hat. This was a top-of-the -line workshop. 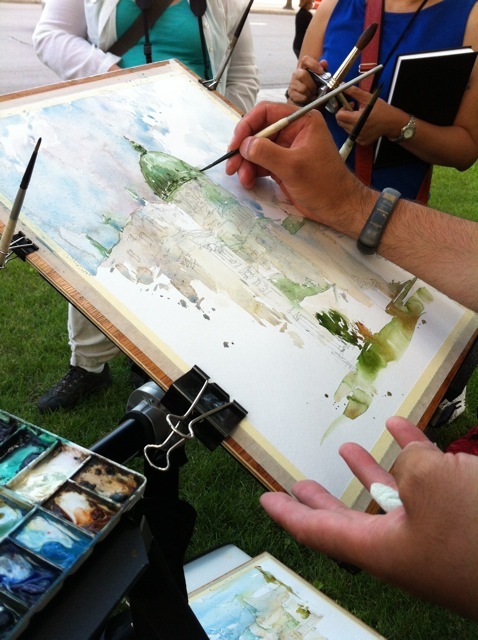 Marc and Shari had done intense preparation both in setting up the sights and in preparing the demos. They anticipated all our needs, and best of all, made it such a great pleasure to learn. A big thanks to both! 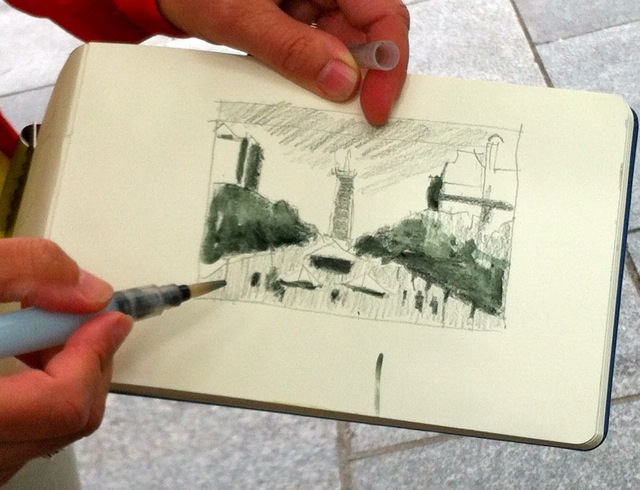 This is a note from the train after our final day of our Urban Sketching workshop in Montreal. 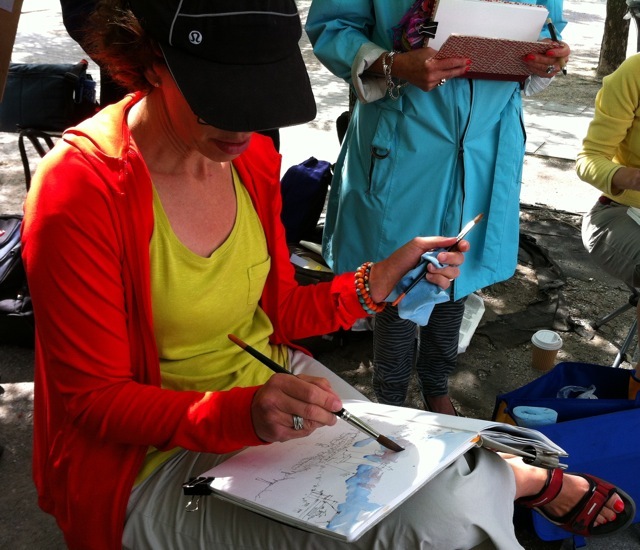 It was a rich and intense three days with Shari Blaukopf and Marc Holmes–two exceptional teachers. 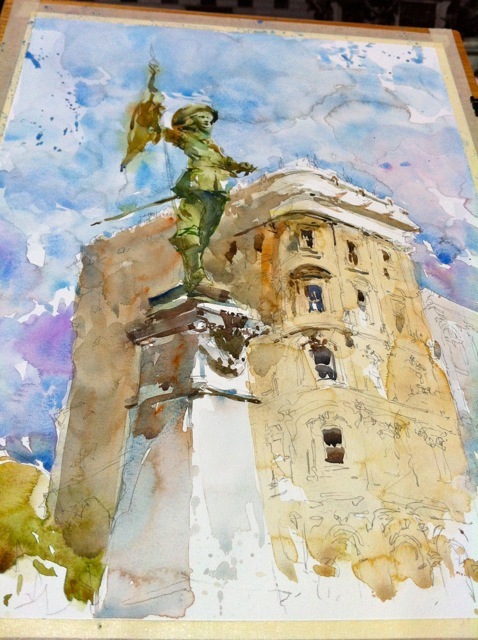 The weather was definitely changeable, but we were so lucky–some wind, a few rain drops, but on the whole great for sketching. There were 30 people in the course from all over North America. We broke into two smaller groups and spent a day with each instructor in two locations and then this morning all together in the beautiful Carré St. Louis. 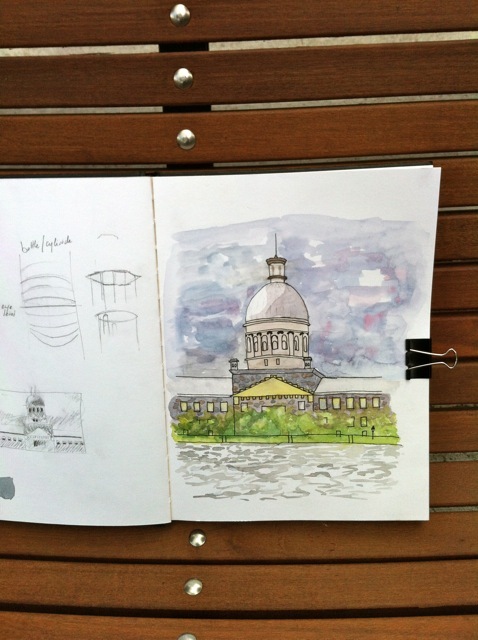 Montreal is so great for sketching. 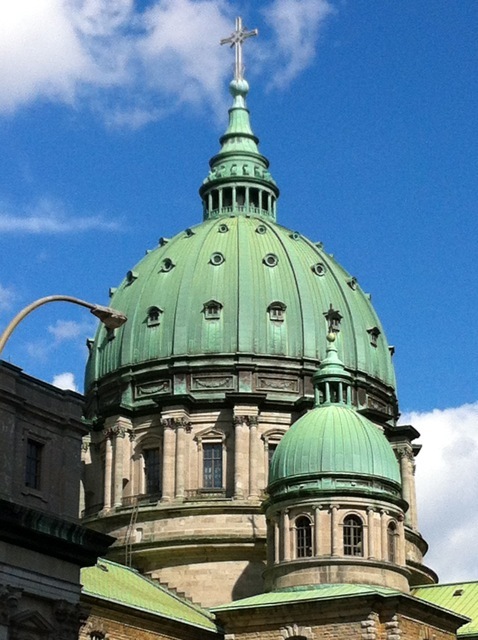 Below are the towers of Marie Reine du Monde basking in Friday’s blue sky and great shadows. 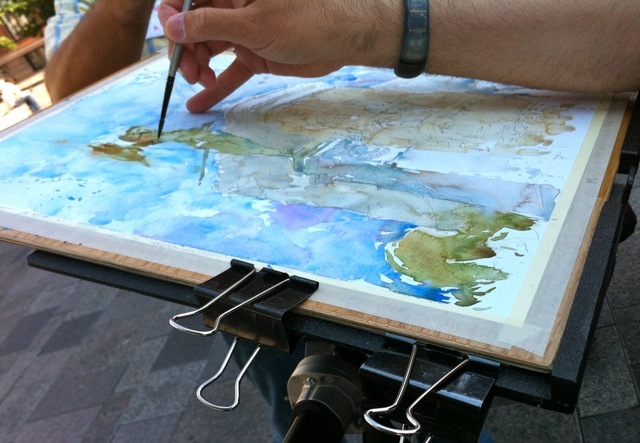 Not all our skies were like this–in fact there was lots of opportunity to learn how to paint turbulence. I spent day one with Marc. 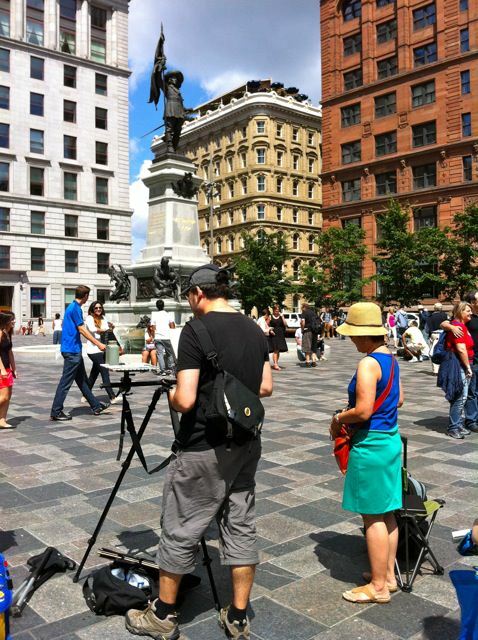 Here are some glimpses of his techniques for pencil sketching and then layering on the paint–first at Place d’Armes and then Marie Reine du Monde. Lots to absorb! The last picture is my first attempt at the paint layers with no ink outline. That’s it for now. Still a couple of hours to go–so I am going to curl up with my music and enjoy the big skies flashing by. More on my day with Shari tomorrow. I made a new triad earlier in the week and before I had even put it in the on-line store, I had an email from Missouri wanting to purchase it. It’s always delightful when something like this happens. 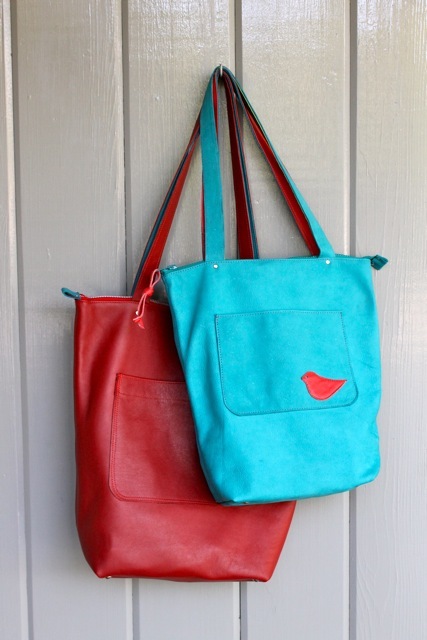 I knew I had enough of the red leather for two more totes. 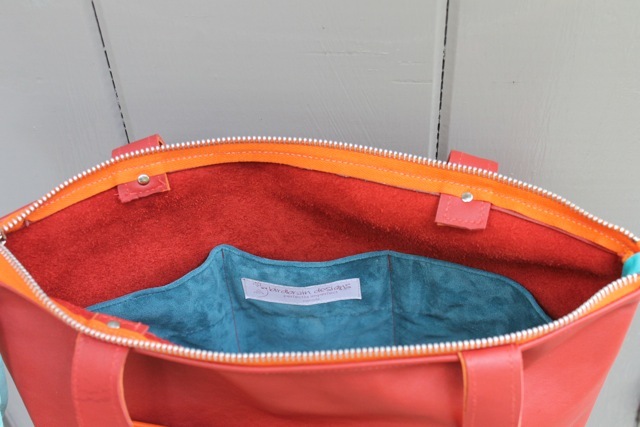 As I was packing the Missouri tote, I was thinking what a great bag it would be for my art supplies–it’s strong enough and big enough to hold the sketch book, the palette, the pencil case, the small water bottle and my wallet, lunch and phone. 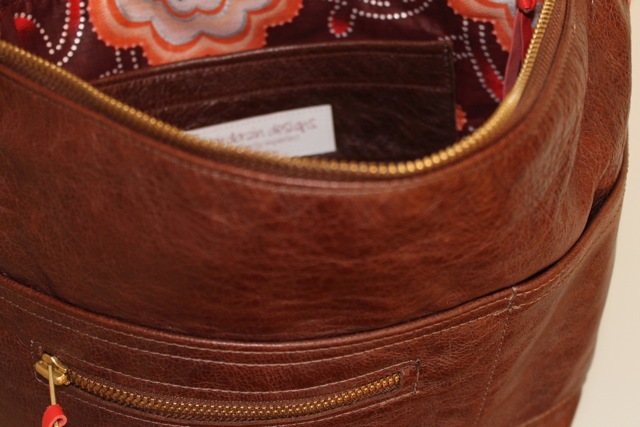 The triple pocket on the inside is perfect for separating out the small things so I can grab them quickly. 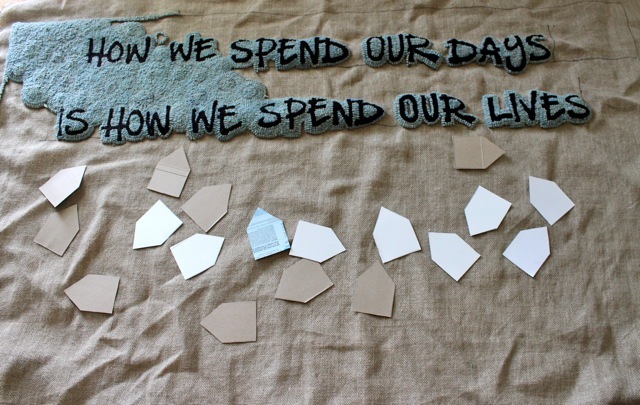 So I set about making another triad for myself. 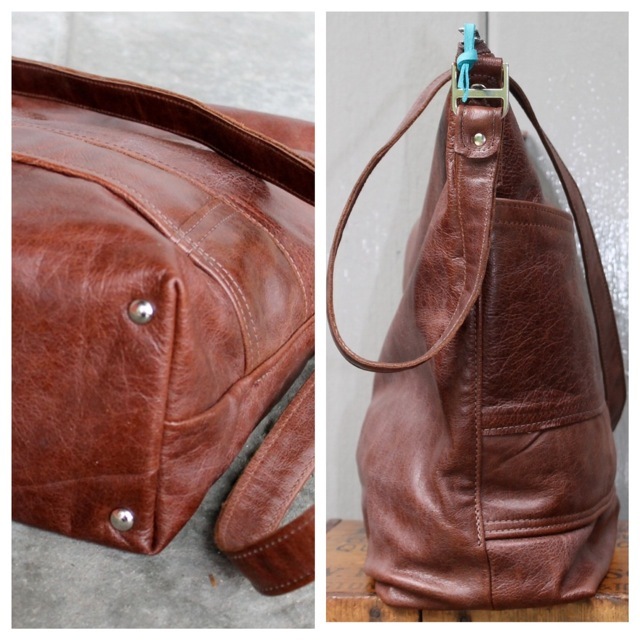 This orangeade leather is some of my very favourite and I have used it sparingly in many bags. 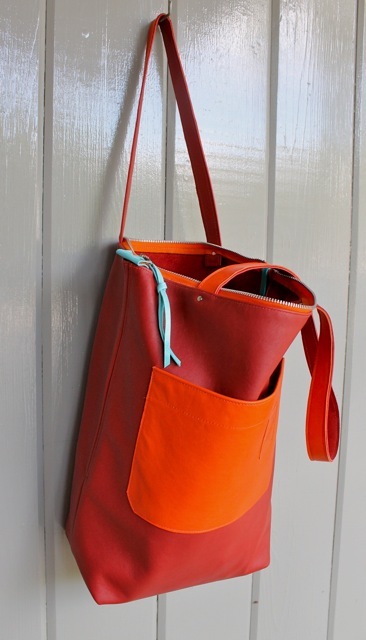 Here is a bag from August 2011 with an orange panel. 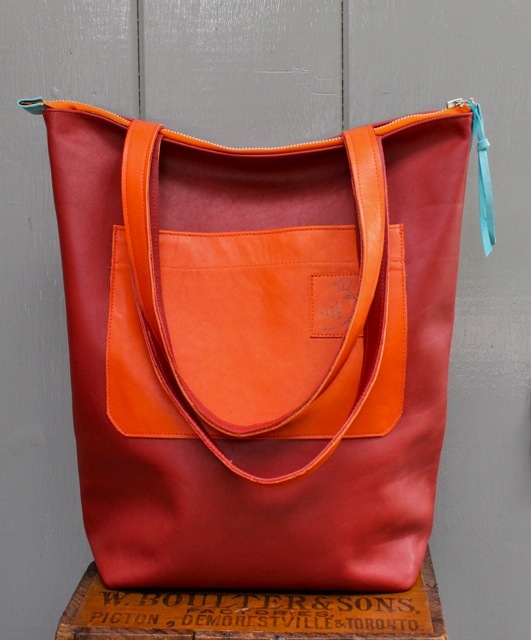 I had just enough of this beautiful orangeade left for straps and pocket. 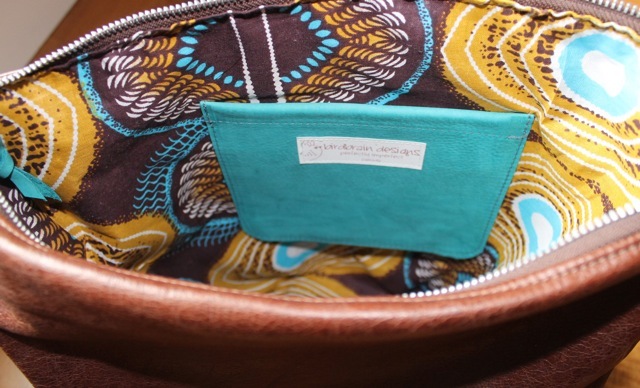 Inside the triple pocket is made from a teal suede skirt. 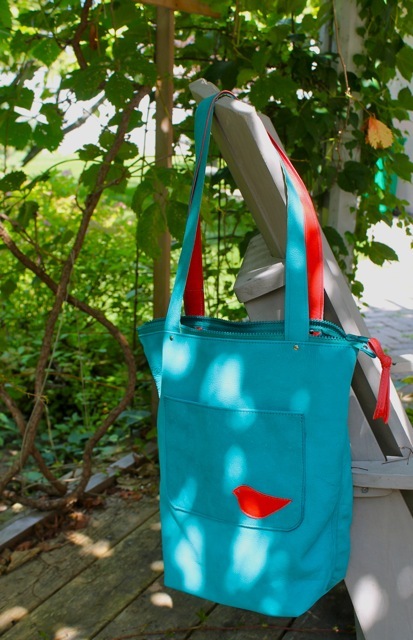 It is unusual for me to treat myself with one of my bags. It’s like the old story of the shoemaker’s children who have no shoes. I always seem to be carrying a reject, one I don’t think is worth selling with smudged graphics or a feature that did not quite work. But this new Triad seems really great and I think I will enjoy using it. I will let you know at the end of the weekend. We went to Kington last night for a special visit and I tossed my new Triad over my shoulder just to try it out. 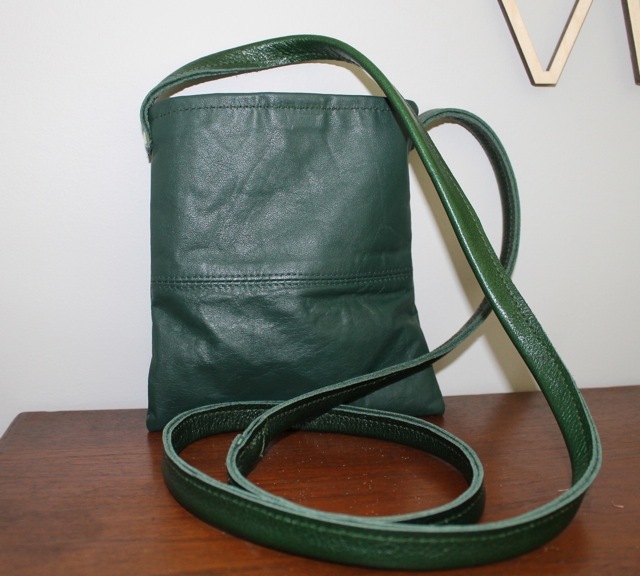 You see I am a fan of the cross-body strap and I wanted to see how these shoulder straps would work with the tote full of all my gear. Would the weight distribution be ok? I am happy to report that Triad III is a big success. 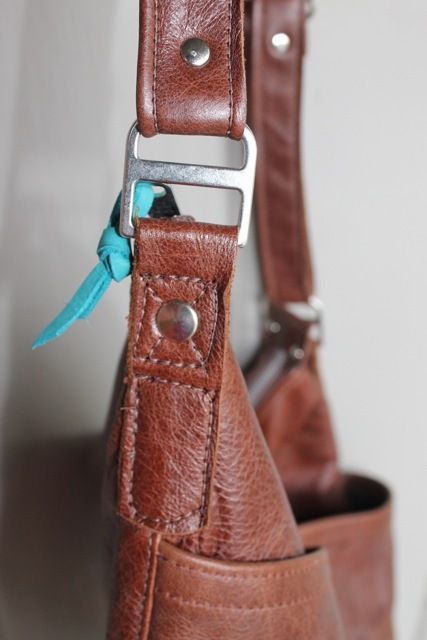 The extra piece of heavy leather riveted in the bottom gives it balance and stability. 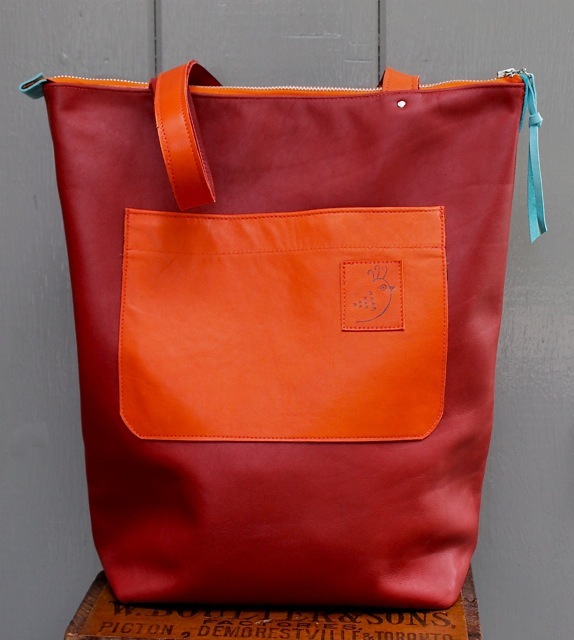 This tote is even a little bigger: 15.5″ wide, 14.5″ long and 5.5″ deep. If you click on the instagram button on the side of the page you will see a photo taken this morning of the Triad packed full of my sketching things. 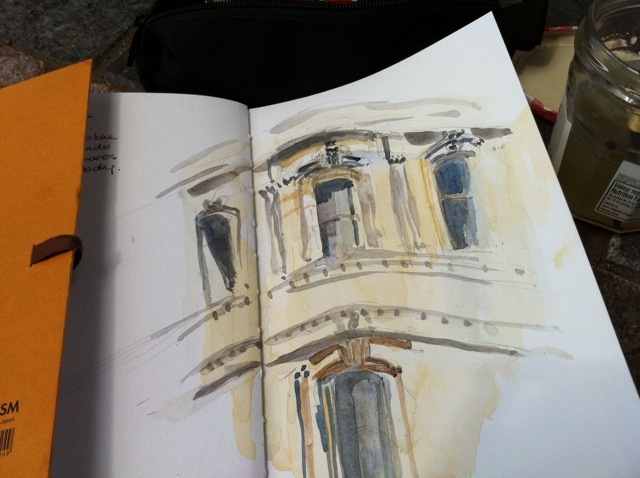 I hope to post later to show you where I am going–this post comes to you from the train.